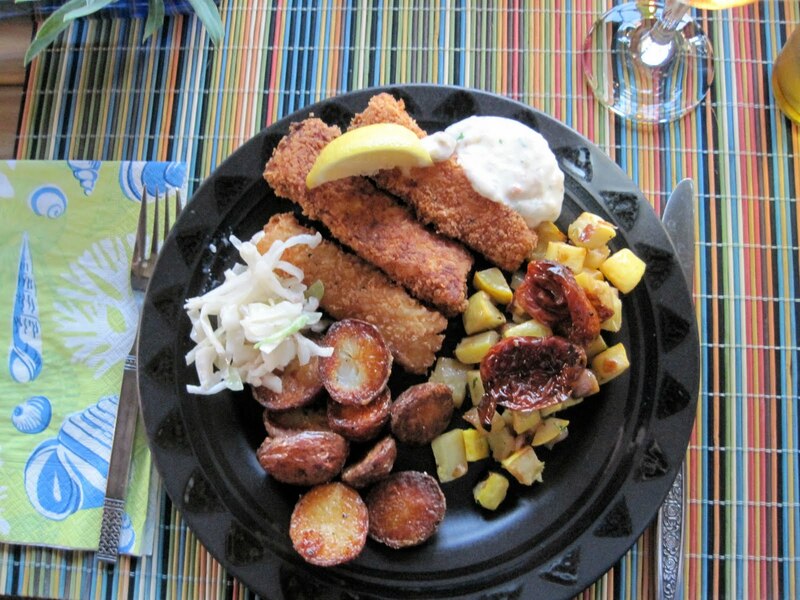 When I was growing up, fish sticks were on the menu every Friday for school lunch. It was years until I realized the school offered fish on Friday for the Catholics among us. It didn’t matter to me why I got them, I always loved that lunch. Probably because I just loved tartar sauce. In retrospect, the fish sticks were awful, breaded and deep fried and who knows what kind of fish was used. But when this recipe appeared, I had to try it. 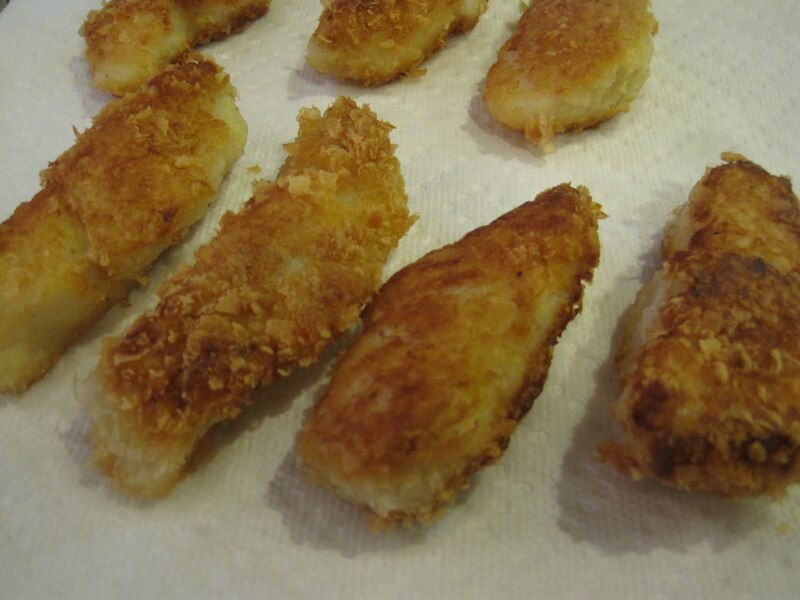 I’m going to tell you how to make fish sticks yourself. Tender, flaky, crispy. Not oily. Not fishy. These are superb – a 2008 Food and Wine recipe that first captured my attention, then my derision, then my admiration. I can hear you already. Potato flakes? Instant potato flakes? Yes. Yes. Yes. Crunchy. Crispy. Delicious. Just give them a try. And don’t call them fish sticks, call them fish fingers, as my British friend does. Doesn’t that sound better? Serve these little crisp delights wrapped up in a tortilla, slathered with sriraccha mayonnaise and some chopped lettuce and radishes for an awesome fish taco. Or serve with traditional tartar sauce, alongside corn on the cob and sliced tomatoes, for the perfect summer meal. And in the deep of winter, fish fingers, with sweet pickle relish in the tartar sauce and local corn and limas from the freezer turned into succotash – well, that just brings summer right back. Set up a dredging station with three bowls. 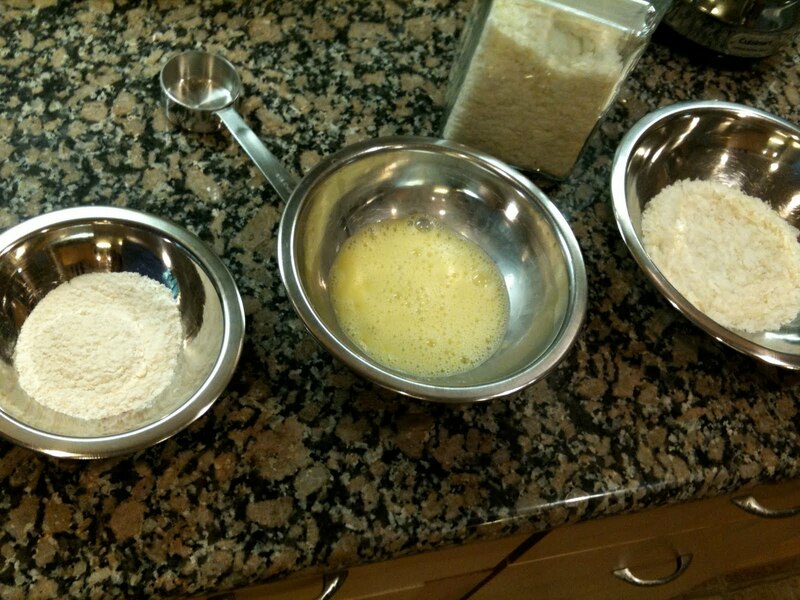 With your left hand, put a piece of fish in the flour. With your left hand, scoop the potato flake mixture over the fish, then lift it and place on a sheet pan ready to cook. Repeat this until all the pieces of fish are coated. 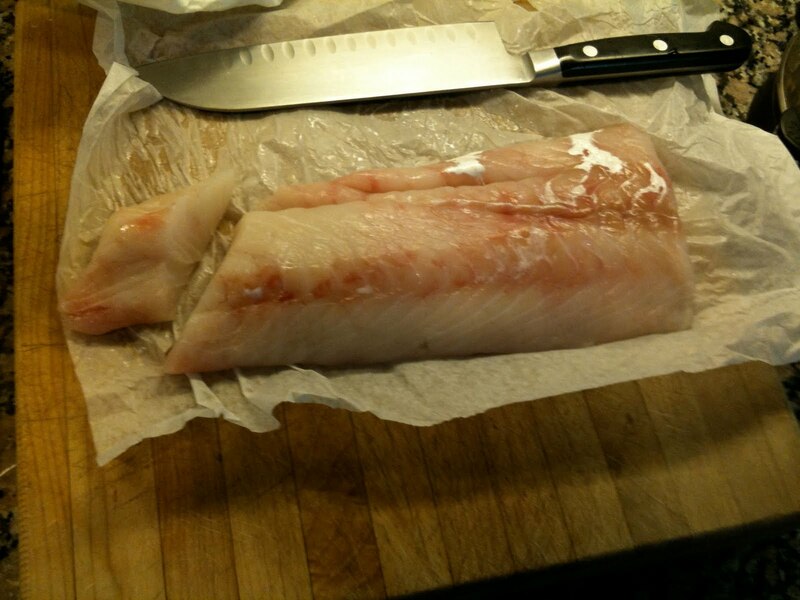 Preheat the oven to 225, to keep the cooked fish warm while you finish the rest. 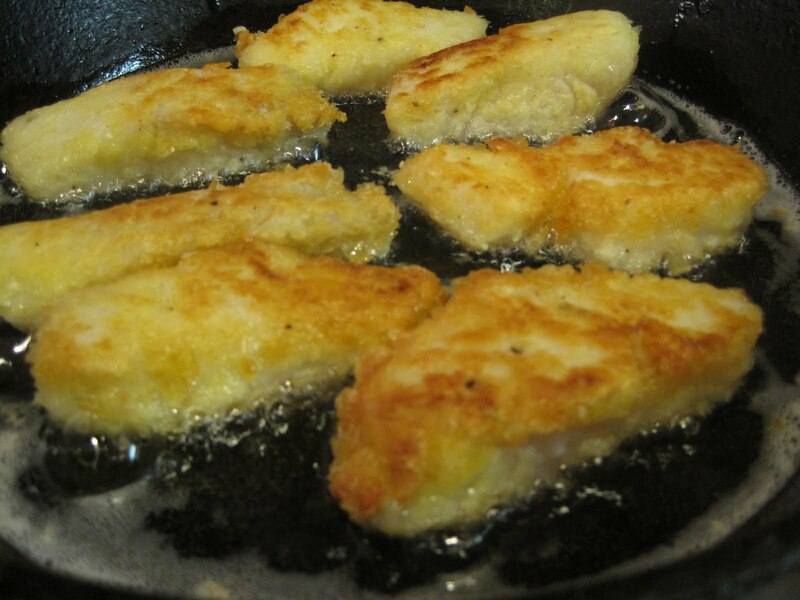 In a straight sided saute pan (or a deep fryer, if you have one), heat about 1″ of canola oil to 325°. When it’s good and hot, slip in the coated fish. Do not crowd. 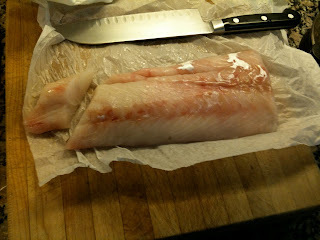 The fish should be golden brown and gorgeous in about three minutes – turning once. Transfer to a paper towel lined sheet pan and pop in the oven to stay warm. Take 1/4 c pickle relish, add 2T plain yogurt and 2T mayonnaise or sour cream, squeeze in a lemon, stir. 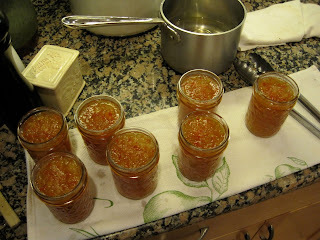 And here’s a perfect, quick canning project for this weekend. 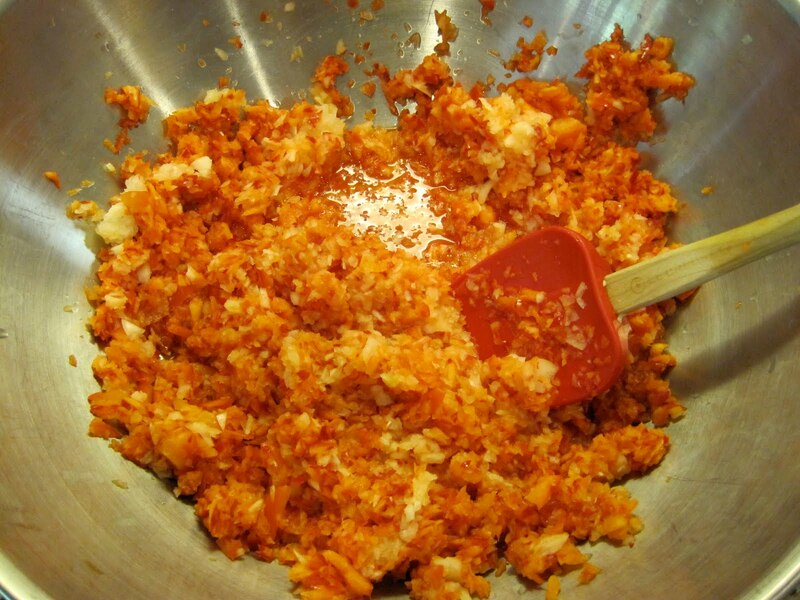 This recipe is so simple if you have a food processor. 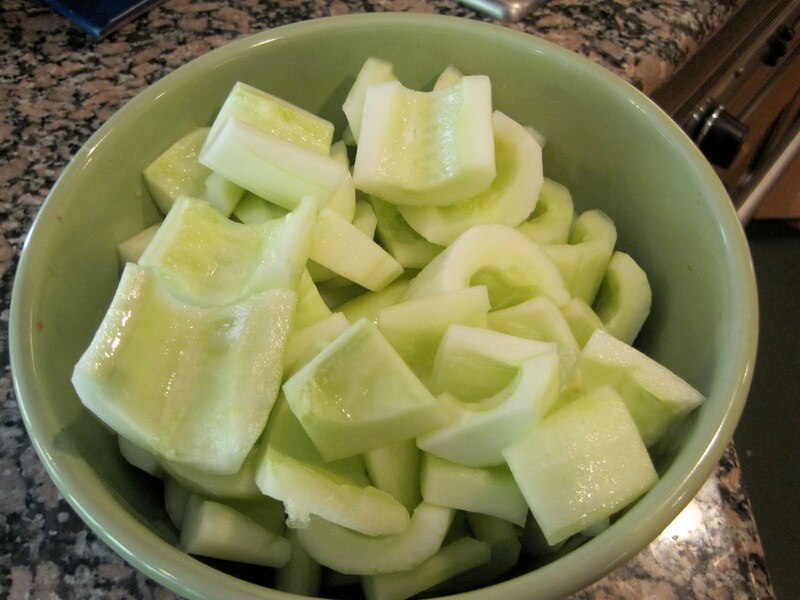 Just buzz the cukes, peppers and onions until finely chopped. Cover all the vegetables with cold ice water and the salt and set aside for two hours. 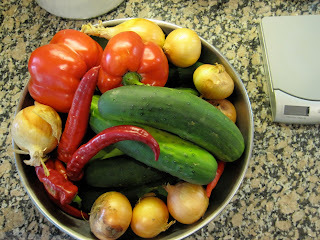 Drain the vegetables, rinse well and then drain in a colander very well. Press against the solids with a large spoon or spatula to get as much water out as possible. 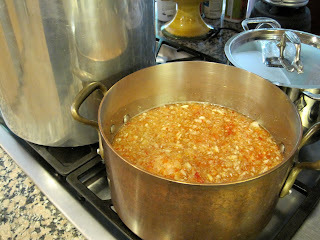 In the meantime, in a large non-reactive pot, bring the sugar, vinegar and spices to a rolling boil. Add the vegetables and bring back to a rolling boil for 10 minutes. Fill hot jars with hot relish and seal with lid and ring. I've never tried making my own fish fingers but I'm sure my kids would love them. Yours look delicious and would make a perfect meal for a busy weeknight meal. I was never interested in eating the school cafeteria food. It never looked appetizing enough to try. Thank you for sharing your recipe. I've eaten my way through one batch of your incredible relish – time for round 2! The fish fingers look wonderful and I happen to keep instant mashed potatoes on hand for all sorts of things – great post! Pretty brilliant, would never have thought of the potato flakes. I may have found this late…but better late than never. I love fish tacos…really cheap ones at this drive thru place near me but I’ve often thought I should make my own and now I’m inspired. I love fish and chips too…basically guess I love crispy fried fish. I mentioned on Twitter that miserable fish sticks were our lunch and dinner fare every Friday growing up in a Catholic household. But to balance that, I must say the Fish Fry’s put on by the church every now and then almost made it worthwhile; almost.